While our actual departure to Switzerland seems like a long ways off (at 93 days away), I know that if I blink, it will be here in an instant. And so I have begun to plan my trip now in earnest. Part of the planning involves keeping a journal about the process, so I have been collecting my notes, ideas, and first impressions this week in an effort to try and wrap my brain around the culture I am soon to be immersed in. Ultimately, I feel like I’m preparing myself for a culture shock. Proper planning will make the trip comfortable and productive, and while I can learn about where I am going before I get there, nothing truly prepares you for actually experiencing that new place. We will be visiting several different universities on our trip. Of course there is a considerable amount of overlap between the structure and function of European Higher Education and Higher Education in the United States; but I did not appreciate my own expectations until I took some time to visit each of their homepages. Each website reflects it’s institution’s philosophy. At first glance, I can tell that there is a lot for us to learn about their principles, values, and simply how they even operate. We will all spend time researching one of the schools more deeply and then sharing that information back to the group. 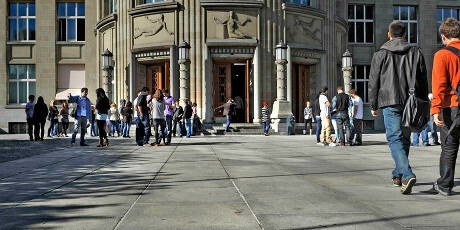 Scuola universitaria professionale della Svizzera italiana (“SUPSI”, University of Applied Sciences and Arts of Italian Switzerland) Photo from institution brochure. I created a list of about 30 expectations that I currently hold about two related topics: 1 European Higher Education; 2 Switzerland in general. My expectations were captured in rough, quick phrases and big ideas about what I think it is like/expect it to be like. These ideas ended up getting spread out through my journal since our last GPP meeting–ideas that popped up immediately after seminar to ideas that were generated out of preliminary research. So far I am having mixed feelings about those preliminary expectations because my research today into the schools on the itinerary is beginning to paint a picture very different (in some ways) from what I had imagined. Also, it has become apparent to me that I didn’t even realize my own bias or expectations until I started to explore and saw alternative philosophies in action. But I do expect that I will be able to feel a profound sense of place while in Switzerland. As a scholar of Landscape Architecture, I am deeply interested in the physical, biological, and cultural dynamics of a place. From what I have learned reading other GPP student projects, I believe this program is going to be a feast for the senses and will no doubt leave a mark on me in a way that will manifest in my future design work. My passport is here… and WAY more quickly than I had expected. I am very happy about this. On the other hand, the Department of State hasn’t returned my marriage licence yet. As I understood it, they were supposed to mail me my documents back (licence & old passport). I keep telling myself they’re coming, but it’s been 10 days now. What gives? If it doesn’t turn up this week, I’ll be starting my telephone and email campaign to find my lost paper. The State of Mississippi has a beautiful blue certificate with a gold notarized seal on it that it gives to the couple and it also keeps one for the State on file. If you ever lose your original or if it becomes destroyed, you can have a copy made, but it will be in black & grey. You only get that first copy in color–so it is important to me that I get it back!